Organizers put a ton of work into planning and executing a craft fair and they’re relying on their vendors to help make it great. You’ve helped spread the word, created tons of amazing stock, showed up on time and were a peach to deal with. But one mistake at the end of the craft fair can put you on an organizer’s naughty list and ensure your application is rejected the next time around. What’s that mistake you ask?….. 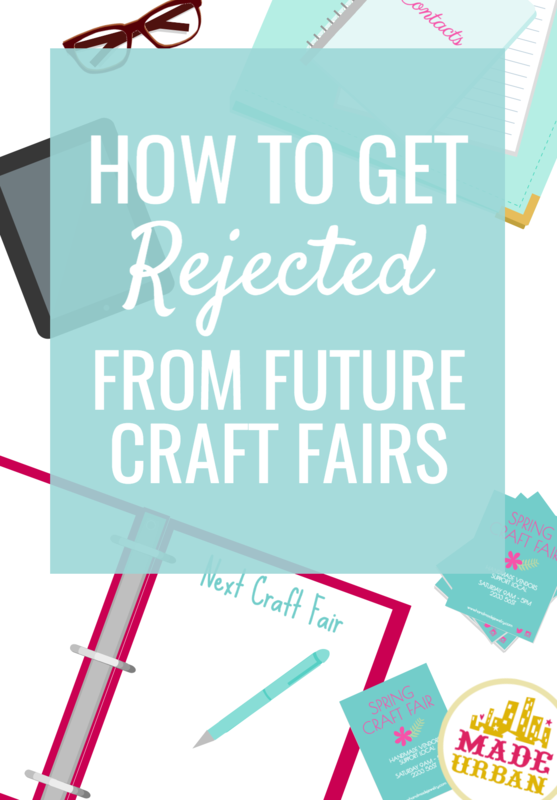 The mistake that is sure to get you rejected from future craft fairs is…..leaving early! When you begin packing up your handmade goods before the craft fair closes, it creates a whole slew of negative effects. You may think that you’re just losing a couple sales but it’s much more than that, it affects your business’ reputation, other vendors and of course the organizer. You can check out all the negative effects of leaving early here. 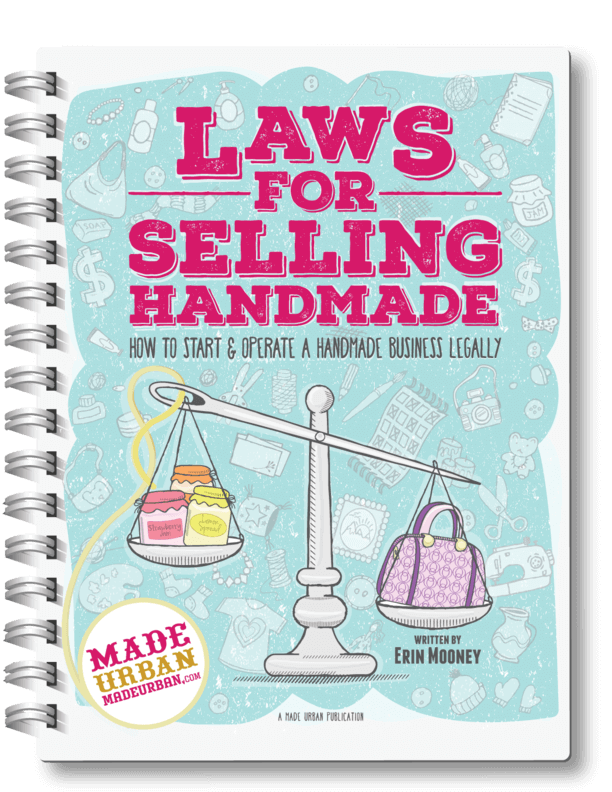 We cover a bunch more un-written rules in our e-book: MAKE MORE MONEY AT CRAFT FAIRS that will keep you in organizers and vendors good graces. And if you want to discover 5 reasons you’re not making more money at craft fairs, check out this article for a few common mistakes you may need to correct. Never! 😉 kidding. But I do want to stress the point that under most circumstances, you should stick to your commitment of selling at a craft fair until the end. There will always be elements out of everyone’s control that can wreak havoc on a craft fair’s attendance but unless it’s a situation similar to those mentioned below, you’re probably best to stick it out. Here are a few examples of situations that would be considered acceptable and unacceptable to cancel last minute on a show or leave early. No one can argue that there are certain situations that require no questioning and if it’s an emergency involving you, a family member or someone you love, don’t let a craft fair get in your way. You undoubtedly know what would be an acceptable emergency situation to warrant your absence (someone’s health) and those that may feel like an emergency but don’t need your immediate attention (getting that last haircut appointment of the day). If something has un expectantly come up, be sure to explain it to the craft fair organizer and let them know you understand this puts them in an awkward situation but there’s just no way around it for you. Making them aware that you know this isn’t ideal may help your application from being rejected in the future. “I forgot that my kid has a game I want to watch this afternoon” does not get you a free pass to leave early. If you have a conflict with your schedule that’s due to your poor planning, don’t make the craft fair and organizer pay for that. That could get future applications rejected. It’s a likely scenario, especially around the winter months and busy holiday craft fair season that can leave you run down. If you’ve got the flu and can’t even imagine having to pull it together for an entire show, first see if there’s someone who can cover for you; a family member you’ll pay back in home cooked meals for the rest of the month or a friend you can pay in commission. If that’s not an option you may have to cancel on the show. If the organizer knows you’re truly sick and would be there if you could, they’re likely to understand and not hold it against you when you apply to next year’s craft fair. Hangovers are the worst but they shouldn’t stand in the way of you showing up to a craft fair you’ve committed to. Sure the organizer may not know that it’s a 24-ounce flu but YOU will and if you were out, other vendors may have seen you indulging a bit too much last night. If that somehow gets back to the organizer, they may not think twice about moving your application to the rejected pile. We’re not talking about an organizer saying there will be 2000 shoppers and only 1500 showed up. We’re talking misrepresentation of what they were organizing and delivering. One event comes to mind; there are many reviews from shoppers and vendors about an organizer who sold the event as a one of a kind craft show not to be missed but ended up delivering empty stalls (some with garbage in them), vendors selling imported goods, moving vendors around mid-show, giving some who paid half the price for a smaller booth, a larger one at no cost (which wasn’t fair to those who paid full price) and a real lack of shoppers. THIS event sounded like a nightmare and I wouldn’t blame a vendor who packed up early and hightailed it out of there. If an event is going to end up hurting your brand and you feel like you’ve been majorly mislead, use your discretion and decide whether it’s worth it for you to hang around. 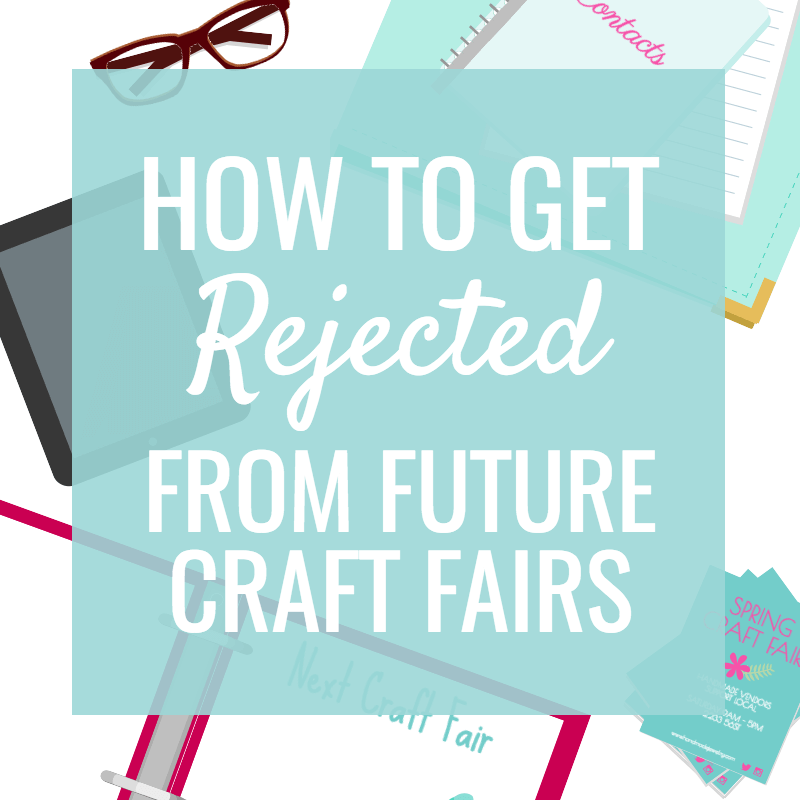 Being rejected from their future events isn’t really a biggie if you have no interest in them. Nope, just not a good reason at all and is sure to get your application rejected next time. Sometimes weather or other events in the city will leave a craft fair with very few shoppers. This is never fun but if you don’t want to burn bridges in the craft community, you should stick around. The last hours of the last day can seem painstakingly slow when you’ve had a busy weekend but don’t start packing up until they close the doors. If you’re attending a craft fair out of town and road conditions are going to make it dangerous to travel, this may be an acceptable situation to cancel an event or head out early so you beat the weather. If your Monday to Friday job is what pays the bills and selling at a craft fair on Sunday while a snowstorm brews is going to make it difficult to get home, you may want to explain to the organizer that you need to pack up Sunday morning (before the show starts) and head home. Craft fairs are awesome but no craft fair is worth risking your life for. If you just don’t feel like selling your goods at an outdoor market on a drizzly day or you don’t want to deal with brushing snow off your car to head to a winter market, that’s not a great reason. Bundle up and make the most of it. Organizers of weekly markets will take note if you’ve conveniently cancelled on rainy days only. You may think it’s your loss since you’re having to eat the cost of a stall but organizers are counting on you being there to give shoppers selection to shop from and fill up their space. You’ll quickly build a name of being unreliable if you pick and choose when you’ll show up, which is sure to get you rejected in the future. If something out of your control happened with your stock causing you to not have enough, this may be an understandable reason to back out of or leave a show early. If your products got damaged because of a flood in your basement or a leak that happened overnight where your booth was set up, there’s not much you can do. The organizers are planning on you to be prepared for their event and to have enough stock to make it through the craft fair. If you’ve grossly underestimated how much stock you need or had astronomical sales that day, you should still stick it out and be at your table to represent your brand and market your business. Packing up mid-show because you ran out of stock may get you rejected the next time around. Apologize to customers that stop by for the lack of stock and hand out business cards so they can find you online. If you’ve still got another day to go, you better get creative! Call in a friend to man your booth while you head home and start creating. Maybe you need to rethink your products and focus on making some smaller items that take less time to produce but put together an album of the other items you can offer. If you do need to leave a craft fair early due to one of the acceptable reasons mentioned above, use our tips in this article so you can do so and leave your good reputation in tact. Thank you for posting this – I think etiquette at shows (as well as in life) is so important. I would also like to point out that poor Vendor-to-Vendor behaviour is also a good way of getting kicked out of, or never being allowed to book a show. I attended one show last spring where a lady pranced in to “visit her friend” and unrolled a bunch of her boot jewelry in the corner. She didn’t have a booth, was supposed to do a home show but it got cancelled, so she crashed this one. She actually interrupted my sale to a customer and wrapped her boot charm around my customers boot. Distracting her and luring her to come to see her wares. I was floored! I didn’t say anything because I don’t feel that ANY confrontation with another vendor (registered or otherwise) is ever warranted when customers are in the area. Keep to your both and never lure customers from another vendor!! Thanks for reading ROMA! Wow, that person definitely needs to read up on her craft show etiquette. All the best to you at future shows! My very first craft show ever I was astonished when most of the vendors started packing up early. If there was ever a reason to pack up, youd think it would be me as i never had one sale all day. The end was near and right at the last moment a young gal and her Dad came by and bought a pair of earrings from me. My first sale ever! I look at it as a contract. I fulfill my part and I can feel proud about my own work ethics. I also look at it if I were in a position to pay someone to be there for me I would expect the full time committment to be honoured. See, perfect example of never knowing what can happen and when 🙂 You have the right attitude! I have been doing craft fairs for a few years now and have come across a few “pet peeves”. The one that bothers me the most are the vendors that sell scented candles. I had a vendor set up next to me that had a bunch of different scented candles burning and it was just way too overwhelming. One scent should be sufficient. I also had a vendor next to me at a show that kept having her friends visit behind her table. They were loud and kept bumping into my table. So annoying! I love it when a vendor will have friends come and they gather right in front of my booth blocking my space from customers to come in. I also did a show where my booth was directly behind the stage where they were having children fashion show. For three hours I had parents blocking my booth to take pictures of their children and some stood inside my booth. I requested a different space the next time but I saw there was no stage this time. And our spaces were not cheap. I was a vendor at an outside craft show last summer. The weather report was not looking good, but we went with hopes of the forecast being wrong. I sell notebooks, photo albums, planners, etc…all paper products. While we had a tent, it wouldn’t protect our products completely. We watched the weather radar closely. When it started to sprinkle, we decided to pack up some of our goods. Within minutes, it was windy and pouring rain. We HAD to finish packing up, or we would have lost everything. The organizer completely understood. Brian: I’m a painter, but I sell matted prints in addition to my framed originals. I had an event that went a bit similar to your experience. After that I did some research into packaging to protect my prints and cards and found sturdy clear plastic bags with adhesive strips to seal them. It’s helped me keep my prints in better condition, and helps my work look more professional. I wonder if using something like that might help some of your product! Clearbags sells them in a wide variety of sizes with some bulk discounting, but I tend to get most of mine from Golden State Art on amazon when I don’t need anything really specific. If you decide to check out this sort of packaging, I’d recommend looking for the sleeves with the adhesive on the bag instead of on the flap, that way if you remove your product to show a customer you don’t risk damaging it if the adhesive on the flap sticks accidentally. Hello I make Luxury Candles with hand painted decorative lids. Usually the unique high end look of my candles brings customers to my booth but when a good vendor is located next to me giving away free samples of cake all potential customers had a their hands and mouths full of cake as they walked past my booth. People who are in the process of eating are not going to stop to come smell a candle. Why a food vendor is right next to a candle vendor is a mystery to me poor placement by the event director if you ask me.